Not at all an AA person here, but accepting my alcoholism for what it is has been the best thing I’ve done for myself in years. I’ve read the Big Book through several times, it’s given me so much insight and understanding, and those stories! 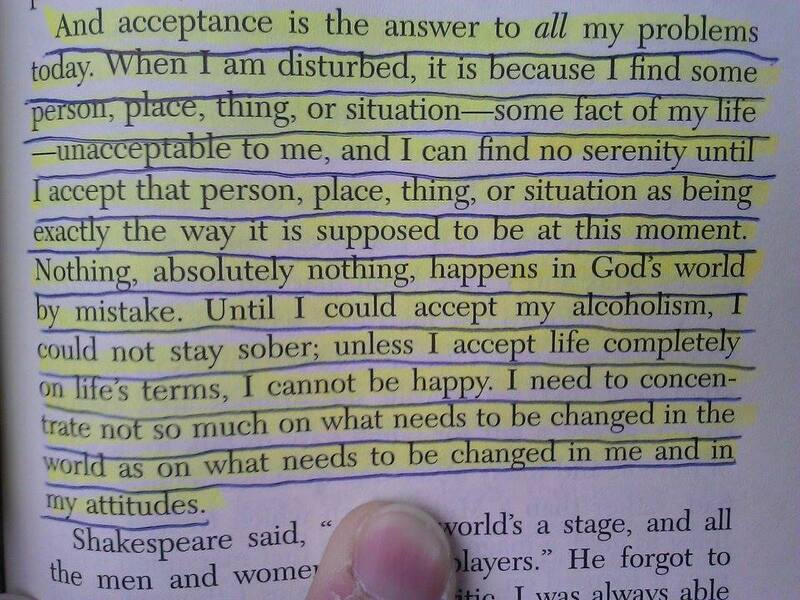 I often refer back to it when I’m feeling “out of sorts”, I think it’s helpful for anyone who may think they, or someone they care about has a drinking problem. When we replace the resentments with acceptance, we can change! there is another great story for woman especially called Keys of the Kingdom which I always related too – identification is how we all get to realise I have what these other guys have!? Acceptance also helps us control our emotions most of which swirl around as resentments because they haven’t been put to bed. Other therapies use acceptance too – it is the key in most recovery paths.